When working lasers it is important you use the right laser safety glasses or laser safety goggles. Metal Cutting Lasers are no exception to the rule. The laser beam is almost always shielded by guards and beam guides, but for safety’s sake one should always wear protective glasses while operating or working near one of these machines. Most metal cutting or welding lasers are high power, at least 200 Watts going all the way up to 4000 Watts or more. 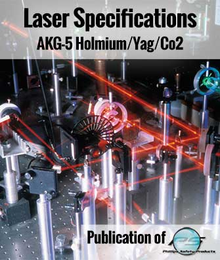 They are typically either CO2 lasers running at 10,600 nm (10.6µm) or Fiber YAG lasers running at 1064nm. LS-CD2-66B is a good choice for CO2 lasers. They will offer an OD of 6+ and will protect you from diffuse reflection (i.e. light off of a wall) and for indirect viewing of the laser. That is viewing the open beam from right angles. Of course you should never look directly into a laser beam, but if you did with these glasses the lenses would be vaporized in a second! LS-KG5-66B is for more protection, and for technicians working on open laser paths. These glasses offer an OD of 7+ at 10,600nm and have actually been proven to protect against direct strikes from a laser beam! You’ll see in the video below – the purple streak is caused by latency of the CCD in the video camera. You should never look directly into the path of a laser, but accidents do happen and you can never be too safe. 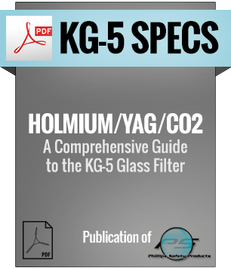 The KG-5 is an excellent choice for the YAG laser, as it offers the same 7 plus OD at 1064nm. In fact, KG5 is one of our most versatile lenses. Appropriate for CO2, YAG, NdYAG, Holmium, and many other lasers. They are virtually clear, and made of glass so are very resistant to scratching. All of the protection in our laser lenses is integrated. It runs through the entire lens from front to back. They are not just clear lenses with a coating that can scratch off and make the glasses unusable. A few minor battle scars will not affect the protection level afforded by our laser lenses. I’ve mentioned OD a few times in this post and want to define that for those who may be unfamiliar. OD stands for Optical Density and is simply a measure of how much of a particular wavelength of energy can pass through a lens. It is a kind of shorthand to let you know the “ strength “ of any particular lens. For example, an OD of 7 means that only .00001% of that 1064nm is being passed through that lens. That means it is blocking 99.99999% of the energy so practically none gets through. One last consideration is plasma flare. When you are cutting or welding with a laser a very bright light can be generated form the material being heated into a plasma state. So just like for conventional welding, one may find it necessary to wear shaded eyewear in order to observe the work as it is progressing. We have a full range of welding clip on lenses that can be attached to the laser glasses to accomplish this. In most cases a Shade 5 or 6 will do the trick. Lasers have opened up new worlds and new processes that were unimagined just a few short years ago. As long as we take the proper safety precautions, and use the right equipment, they will continue to be one of greatest tools of manufacturing and development.